One of the common denominators through my life since I was eight years old has been the television show STAR TREK. I loved watching it. What I found really incredible was that my Grandparents loved watching STAR TREK with me too. When I heard the news in June 1983 that the space shuttle Enterprise was going to be piggybacked on a 747 jet over the city of Toronto, I immediately knew that this was one show that I didn’t want to miss. Mind you, I wasn’t looking forward to facing Toronto’s busy afternoon traffic. If I was going to make this happen, my fears would have to be set aside. I was determined to watch this epic one time only episode of science fiction come to life. It’ll be worth it I told myself. This will make for the memory of a lifetime. Then I though to myself, how can I make this big occasion even better? That’s when I made a quick phone call to my Grandparents to see if they were interested in joining me and Jennifer. 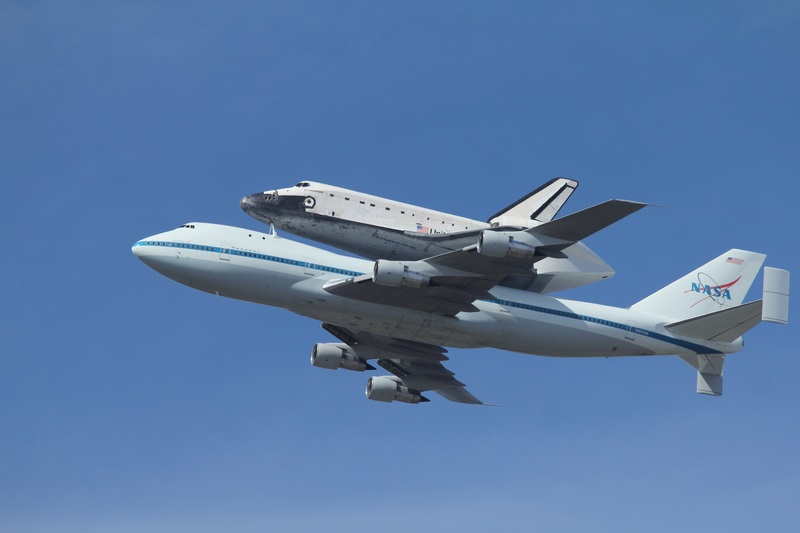 Now, it wasn’t so much the fact that I was going to see the space shuttle that made me happy, it was the fact that I would be sharing the experience with my Grandparents. So, I packed my three year old daughter in the car and drove across town to Scarborough to pick up the Grandparents. Then I set my coordinates for the Canadian National Exhibition waterfront where there was lots of parking and more importantly, an unimpeded view of the entire sky. The weather was hot and sticky. Further, my Grandfather could only walk so far. There were lots of hoops to jump through to ensure that this adventure would unfold seamlessly. I tried not to worry and kept telling myself, in the end, it’ll be worth it. We arrived at our destination, parked, and proceeded to the viewing area. The media was present along with a light crowd. Parts of the sky were overcast, and a cool breeze brought some relief from the heat. We were situated right next to the Lake Ontario waterfront with our eyes on the skies, guessing that the space shuttle would be coming in from the east. The jet flew in fast but low, ensuring that all spectators got a good look. As fortune would have it, the moment that the shuttle was directly overhead, the cloud cover blocked the sun from our eyes. The resulting shade gave us a clear but very fast image of the space shuttle Enterprise. My Grandmother was so delighted. Incredibly, the whole thing was over in a single minute. Then it was time to take everybody home. In the weeks that followed, my daughter Jennifer received a toy space shuttle from my Grandparents. How they loved to watch her play with it. I’m grateful that we had the opportunity to see the space shuttle Enterprise, namesake of the starship from my favourite television show STAR TREK. Yes, it was definitely worth it! My.Daily.Distraction ~ Post 125: S.W.A.K. I will always regret that I never gave my Grandmother a tour of the post office where I work, while I still had the chance. She was the most prolific letter writer I’ve ever known. She loved sending letters. Indeed, she would take time out of every day and write out postcards and letters to friends and family. I would have shown her that the post office is more vibrantly mechanized than she could have ever imagined. From the tow motors carrying big steel cages crammed with parcels and containers of mail, to the video coding desks, culling belts and letter sorting machines, she would have loved the magic that she was witnessing. However to me, it’s just organized chaos. The plant where I work is full of machines that can each process almost 50,000 pieces of mail an hour. During the Christmas period, 1.5 million pieces of mail are dumped, machined, sorted and dispatched each twenty-four hour period. That’s a lot of mail. One of my favourite authors, Antoine De Saint Exupery, author of ‘The Little Prince’ was among the first pilots to ever fly mail from point to point. In his book Wind Sand and Stars, he eloquently recorded his thoughts as he flew his plane with it’s cargo of mail over the Sahara Desert. Mail in the late 1930’s was very different from what it is now. Today the majority of mail is business related. The mail stream consists mostly of credit card bills, receipts, invoices, account statements, and of course junk mail. However, back then the mail consisted almost entirely of personal letters. These were letters from mother to son, husband to wife, friend to friend, beloved to beloved. And so, as this pilot and author flew high in the sky alone at night with his cargo, he marvelled at the stars above and pondered the points of light below while trying to imagine the precious contents of the letters. Antoine De Saint Exupery firmly believed that he was doing an important task. The letters he carried contained validations of love and friendship from loved ones separated by time and distance. It was indeed a different world back then and I wish we could get some of it back. It might do our digitized hearts some good.